Mark Winkworth Sensei, 5th Dan (godan) Shin Budo Kai and head instructor at Durango Shin Budo Kai. 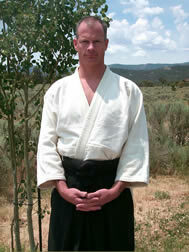 Mark began aikido in Albuquerque in 1994 under Wade Ishimoto Sensei. In 1996 when Ishimoto Sensei moved away, he helped establish a new dojo location and continued practicing under Jim Redel Sensei, receiving his Shodan in 1998. In 2000 Mark moved to Durango and in 2003 was tested and promoted to Nidan. After practicing with various local groups, he helped establish Durango Shin Budo Kai in 2003. He was promoted to Yondan in 2010 by Imaizumi Sensei. Michael Wilkinson, Sandan - 4th degree black belt (yondan), began his study of aikido with Kokikai Aikido in 1999, then began practicing Imaizumi’s aikido in 2001. Steve Self, Sandan, 4th degree black belt (yondan), began his study of aikido in The Bay Area of California in the early 80s, practiced a bit in the Hudson Valley of NY, San Francisco, and more consistently in Mill Valley with Richard Heckler, Wendy Palmer and George Leonard Senseis in the 1990s. He resumed practice in Durango in 2001. He is an instructor for DSBK Aikido and teaches the Ki Development class.